Simple labeling with eco-friendly, “green” undertones accentuates the bottom line of this all natural, non-prescription product promoting anorectal health. The product claim is to restore anorectal health in as little as two days. The main focus seems to be on managing constipation, but they do claim that healthful results are attained in a mere two days.What exactly that entails seems rather vague. There is no grand promise of cures or even relief, so what does this product actually do? The recommended dosage is 2-3 tablets daily for a full 30 days. 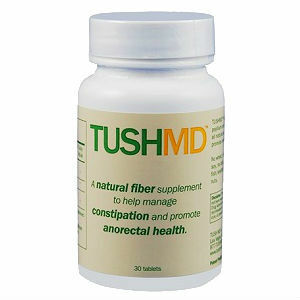 For one bottle of Tush M.D. the price is set at $34.99 which includes 30 capsules. These pills can be purchased in larger quantities, which might be necessary given their guarantee policy (read below) says the product should be used for a full 30-days before returning. Given the dosage is 2-3 pills a day, one bottle will not be enough to keep to the 30 day pledge. A 45-day money-back guarantee is offered for this product. Now, there are contingencies on this refund. The website says the pills need to be taken a full thirty days, and if you are not satisfied with the results, to then return the product within 45 days for a complete refund, less shipping costs. Essentially, that leaves you with a return date of fifteen days. This does not go with the two-day claim, then again, the claim was for health, not actual relief, and leaving the actual time it takes this product to work more in the category of thirty days. Not fast acting. There seems to be no claim of any relief to hemorrhoid symptoms other than constipation relief, unless you count that the bromelain is said to reduce inflammation. However, if you research this ingredient, the inflammation they are speaking of is linked to that of the nose and sinuses, after surgery or injury. For more definitive answers, we sought out customer reviews. Unfortunately there were not many, but the ones that were found were less than stellar. John Parker	reviewed Tush M.D. on September 3rd	 and gave it a rating of 2.